13:45. The doorbell goes ding-dong. The dog barks. The friendly postman drops off a parcel… a surprisingly heavy parcel, marked as “registered letter”. I dutifully sign for it. I wonder if this truly is what I had almost not expected to arrive (but secretly hoped it would). Hmmm… looks like it? Wow! The postage alone was R178.90 (14.50 euros = $22.36). I carefully tear it open and out pour some ten CDs, a DVD-ROM, and a book. I analyse. I scratch my head. I jump up and down in excitement. The dog barks some more. 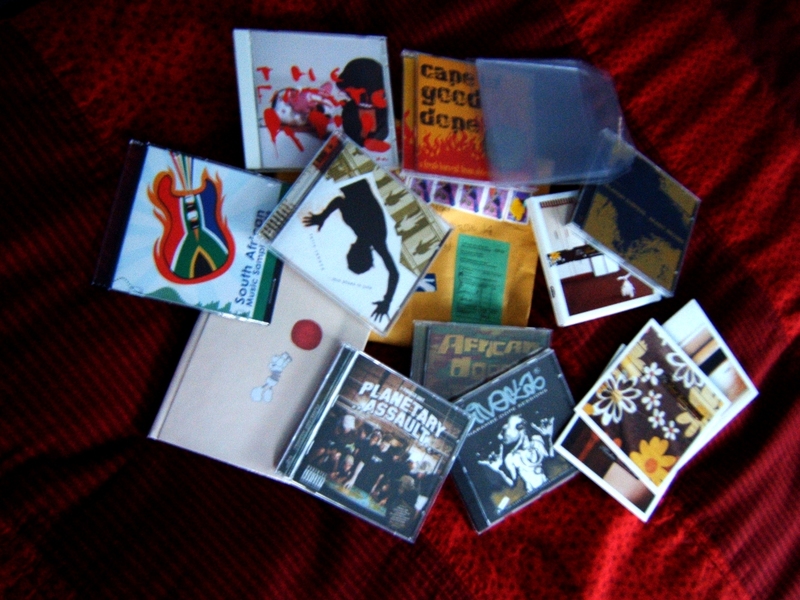 The contents of the parcel turn out to be a great selection of material from the African Dope stable (sans jewel cases to cut down on weight, new ones of which were promptly fitted) and effectively a batch of more work for discogs. Wow! One of the little perks of being a moderator… or a subtle bribe by Krushed & Sorted? Profile: Krushed & Sorted, consisting of members Roach and Fletcher (DJ Dope), is one of South Africa’s legendary underground DJ outfits. They’ve grown from humble roots into one of the most sought-after acts in the flourishing Cape breakbeat / drum ‘n bass / lounge scene, having hosted headline DJ sets at events such as The Camel Experience, Rustler’s Valley Easter Festivals ’98 & ’99, Ninja Tune Tour, and the Balearic events. Their Acid ™ Made Me Do It debut album, a “celebration of the home studio, created almost entirely on a 5-year old Pentium 166 computer, a Yamaha A3000 sampler and cutting-edge audio production software” was assembled entirely at their own Krushed & Sorted Studios in Cape Town and put their African Dope Records label on the map in 2000. Moderating can be a tough job. Sure, we do get the odd few “thanks for helping” messages that shine like a guiding light in the smog created by non-responsive or otherwise abusive users (and I truly take my hat off to those who’ve done it for longer than I’ve been active on the site) but something like this parcel — a promise kept, a token of appreciation… sweet! Oh, and even for someone who dislikes hip hop there are indeed some wonderful gems amongst the selection, make no mistake there. Gladly. I like what I’ve heard so far. Thanks! This entry was posted in Music and tagged bribery, CD, discogs, freebies. Bookmark the permalink.